Building a home addition is a great way to add space to your home. The cost of home additions however can be very expensive depending upon if you are building a home addition onto your existing home or simply finishing an unfinished space such as a basement. Home addition costs per square foot, when building an attached addition, are typically higher than new home construction costs due to the fact that the home addition has to tie into the existing home. To calculate home addition costs you first need to determine the size, features and materials desired in your home addition. If you are building an attached home addition, start by sketching out the footprint on the existing plot plan of the property. Make sure to draw the home addition footprint to scale when appending it onto the main footprint of the home. After sketching out the home addition foot print check to make sure it is not encroaching into any setback areas, leach fields, easements, or other items that may prevent it from being constructed. At this stage you may want to check with your local building inspector or homeowners association, if you have one, to see if your basic home addition footprint meets all federal, state, local and homeowners association requirements. Once you’ve determined that the basic footprint for your home addition is “legal”, you can then move on and begin to flesh out the specifics of your home addition so that you can determine your overall home addition costs. You may want to consider using a home design software package such as, Chief Architect Home Designer Suite 10, at this point. There are various home design software packages on the market today that are inexpensive, fairly easy to use, and can produce the drawings and other information you’ll need to successfully pull building permits. Prior to actually going full throttle on your home addition design plans you should also establish an overall budget. Establishing a budget early on can help you to set limits on the features and materials used in the home addition project. As soon as you have a set of completed home addition design plans you may want to meet with a local realtor to assess (1) the current value of your home and then (2) the value of it after adding on the home addition. You can then compare this market analysis with the actual cost of building the home addition to see if it makes financial sense. After developing your home addition design plans and determining your overall home addition costs you can then move forward in obtaining contractor bids and getting financing, if required. 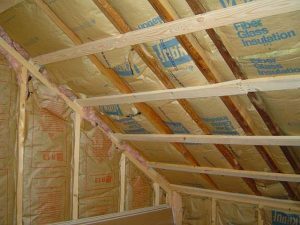 Make sure to get home addition contractor bids from at least three contractors and make sure to check their references. 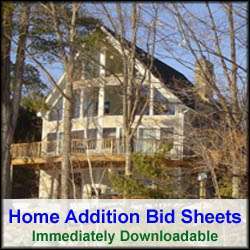 My Home Addition Bid Sheets are ideal for helping you through the contractor bidding process and can save you a fortune in preventing common home construction mistakes, including hiring the wrong home addition contractor. Typically when establishing a home addition cost budget there is a cash component and borrowing component. By generating a good set of home addition construction plans and obtaining competitive bids, a bank will be able to quickly assess whether or not to lend you money. Assuming your credit is of high quality and your home addition makes market sense you should have no problem getting construction lending. With building plans, financing and the general contractor identified you can then pursue your building permits. It’s important to keep in mind that the cost of home additions will vary widely with real estate market conditions, and the local cost of material and labor. Home addition costs will also vary with materials used and the particular home addition design. Contractor bids, however, should not vary widely when bidding on the same project. Thus be wary of the low ball or high ball quotes you may get. Each type could be fraught with danger. Again, checking references is key to ensuring a quality job at a fair price. Also make sure to check references on older and newer projects associated with each prospective home addition contractor. This way you can understand their current work habits as well as their quality of work.